(1) This includes structures such as bridges, crane girders and machinery supports. Existing similar structures subject to the same loading sources may be used to obtain the amplitude, phasing and frequency of the applied loads. (2) Strain, deflection or acceleration transducers fixed to selected components which have been calibrated under known applied loads can record the force pattern over a typical working period of the structure, using analog or digital data acquisition equipment. The components should be selected in such a way that the main loading components can be independently deduced using the influence coefficients obtained from the calibration loadings. (3) Alternatively load cells can be mounted at the interfaces between the applied load and the structure and a continuous record obtained using the same equipment. (4) The mass, stiffness and logarithmic decrement of the test structure should be within 30% of that in the final design and the natural frequency of the modes giving rise to the greatest strain fluctuations should be within 10%. If this is not the case the loading response should be subsequently verified on a structure made to the final design. (5) The frequency component of the load spectrum obtained from the working period should be multiplied by the ratio of the design life to the working period to obtain the final design spectrum. Allowance for growth in intensity or frequency, or statistical extrapolation from measured period to design life should also be made as required. (1) This includes structures such as masts, chimneys, and offshore topside structures. The methods of derivation of loading spectrum are basically the same as in C. 1.1 except that the working period will generally need to be longer due to the need to obtain a representative spectrum of environmental loads such as wind and wave loads. The fatigue damage tends to be confined to a specific band in the overall loading spectrum due to effects of fluid flow induced resonance. This tends to be very specific to direction, frequency and damping. For this reason greater precision is needed in simulating both the structural properties (mass, stiffness and damping) and aerodynamic properties (cross-sectional geometry). (2) It is recommended that the loading is subsequently verified on a structure to the final design if the original loading data are obtained from structures with a natural frequency or damping differing by more than 10%, or if the cross-sectional shape is not identical. (3) A final design spectrum can be obtained in terms of direction, intensity and frequency of loading, suitably modified by comparing the loading data during the data collection period with the meteorological records obtained over a typical design life of the structure. (1) This includes structures such as travelling cranes and other structures on wheels, vehicles and floating structures. In these types of structure the geometry of the riding surface should be adequately defined in terms of shape and amplitude of undulations and frequency, as this will have a significant effect on the dynamic loading on the structure. (2) Other loading effects such as cargo on and offloading can be measured using the principles outlined in C.l.l. (3) Riding surfaces such as purpose-built test tracks may be used to obtain load histories for prototype designs. Load data from previous structures should be used with caution, as small differences, particularly in bogie design for example, can substantially alter the dynamic response. It is recommended that loading is verified on the final design if full scale fatigue testing is not to adopted (see C3). (1) Where simple members occur such that the main force components in the member can be calculated or measured easily it will be suitable to test components containing the joint or detail to be analysed. 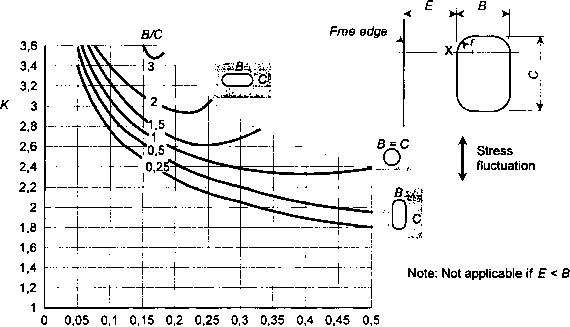 (2) A suitable specimen of identical dimensions to that used in the final design should be gauged using a convenient method such as electric resistance strain gauges, moiré fringe patterns or thermal elastic techniques. The ends of the component should be sufficiently far from the local area of interest that the local effects at the point of application of the applied loads do not affect the distribution of stress at the point. The force components and the stress gradients in the region of interest should be identical to those in the whole structure. (3) Influence coefficients can be obtained from statically applied loads which will enable the stress pattern to be determined for any desired combination of load component. If required the coefficients can be obtained from scaled down specimens, provided the whole component is scaled equally. (1) In certain types of structure such as shell structures the continuity of the structural material may make it impracticable to isolate components with simple applied forces. In this case stress data should be obtained from prototypes or production structures. (2) Similar methods for measurement may be used as for component testing. For most general use it is recommended that static loads are applied as independent components so that the stresses can be combined using the individual influence coefficients for the point of interest. The loading should go through a shakedown cycle before obtaining the influence coefficient data. (1) The same method as described in C.2.2. may be used to verify the stress history at a point during prototype testing under a specified loading. In this case data acquisition equipment as used in C.l.l should be used to record either the full stress histoiy or to perform a cycle counting operation. The latter can be used to predict life once the appropriate Aa-N curve has been chosen. (2) A further option, which may be used in the case of uncertain load histories, is to keep the cycle counting device permanently attached to the structure in service.